I picked the neon-green-and-red book a couple of weeks ago at Landmark before I’d heard or read anything about it. Its colouring and comic book-type cover caught my eye at first, but I ended up buying it for a very simple reason — I love good ol’ Cyrus and his oddball sense of humour. Always have. (In the interest of full disclosure, it also didn’t hurt that the book cost about what you’d pay for coffee and a muffin (yum) at Barista. Still more expensive than Chetan Bhagat, of course, but then again, no painfully obvious typos and glaring grammatical boo-boos either). Having finished the book, I can tell you that my reasoning was sound i.e. 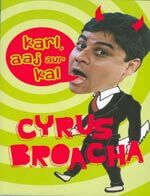 if you’re a fan of the Cyrus Broacha brand of free-wheeling goofiness, you’ll enjoy ‘Karl, aaj aur kal’. This isn’t really a work of fiction in the traditional sense. I mean, there is a loose narrative structure about two friends Karl and Kunal (quite obviously based on Kunal Vijayakar) and how they met at school in Mumbai and went to college together, and so on. But if you’re looking for story, plot, etc., this isn’t the book for you. This is, quite simply, like having Cyrus stand before you and hold forth for a few hours on Parsi families and opera-loving fathers, St. Xavier’s College and the Mumbai theatre scene, Bollywood, politics and marriage. You can literally hear him stop to take a breath between the lines (he even informs you occasionally that he’s bored and moving on to something new). Which means, like any other Cyrus monologue, you have absolutely brilliant moments that make you burst out laughing, like I did while reading it in the middle of a crowded coffee shop recently, and then there are the over-the-top jokes that make you go ‘meh’ or the excessively rambly bits that you can thankfully skim over in book form. What makes it worth a read overall is that Cyrus’ voice comes across so clearly at all times — down-to-earth, authentic and real. No pretentiousness, no play-acting. There are a lot of Indian writers out there trying to be like someone else in their humour writing — Helen Fielding or God forbid, P.G. Wodehouse, and in the midst of it all Cyrus and ‘Karl, aaj aur kal’ is a breath of fresh air.